Suvarna Prashana is one of the 16 essential rituals described in Ayurveda for children. This is a process in which Suvarna (purified gold) is administered with herbs, ghee and honey in liquid or semisolid form. Suvarna Prashan can be given to age group of 0-16yrs. It can be done daily early in the morning, or at least on every Pushya Nakshatra – an auspicious day- which happens to come after every 27 days, given on this day it bestows excellent benefits. Suvarna Prashana increases immunity and develops resistance against common infections, thus prevents children from falling ill very often. It builds physical strength in children and enhances physical activities, and also improves stamina for the same. A regular dose of Suvarna Prashana improves child’s intellect, grasping power, sharpness, analysis power, memory recalling in an unique manner. It stimulates digestive fire, improves digestion and decreases related complaints. 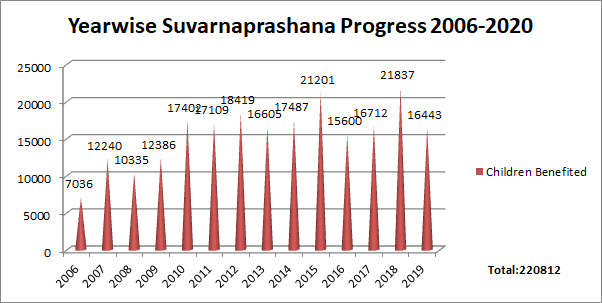 Overall it makes child healthier, children taking Suvarna Prashana doses regularly can be easily distinguished from their outstanding physical and mental ability. Website Designed & Maintained by Mihir H Patel.